'The Pine Woods of Viareggio', a watercolour by John Roddam Spencer Stanhope, sold by Jeroen Markies Art Deco at the Birmingham NEC. The Pine Woods of Viareggio was ticketed at £45,000 by Jeroen Markies Art Deco. Stanhope is associated with the second-wave of the Pre-Raphaelites. 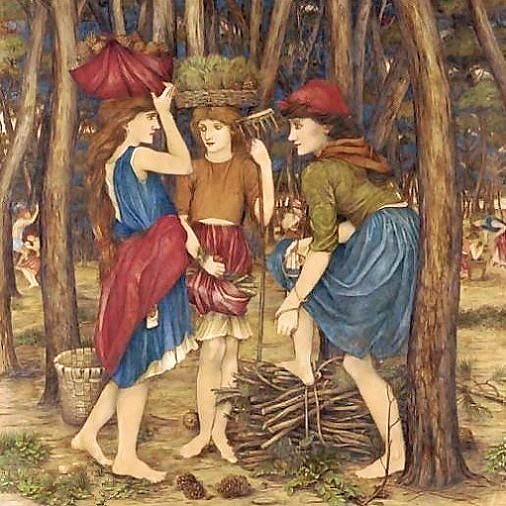 He settled outside Florence in 1873 and completed this large picture – depicting three young girls collecting firewood and pine cones – in c.1880. Offered re-lined in its original frame, the picture, 5ft 5in x 4ft 9in (1.65 x 1.4m), was sold to a new client, local to the NEC. The November 15-18 event hosted nearly 200 exhibitors. Other sales included a c.1915 silver-plated salver by the Duchess of Sutherland Cripples’ Guild from Steve Bentley Decorative Arts & Lighting. It was purchased at £325 by the headmistress of Ibstock Place School in West London, home of the Duchess of Sutherland from 1912-21.